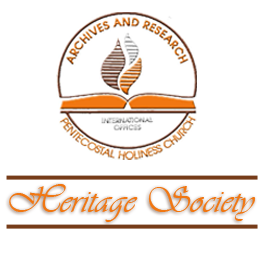 The IPHC Heritage Society was established in August 1997 to identify individuals who understand the importance of the Pentecostal Holiness Church heritage and are willing to be financial supporters of the IPHC Archives and Research Center. Membership may be gained in the Heritage Society when joining as a Lifetime Member or joining each quadrennium. Members’ names are placed on a large beautiful Heritage Society plaque that is prominently displayed at the entrance of the IPHC Archives and Research Center. Download and print the Heritage Society Membership Form. Use the form to select a membership: lifetime or quadrennium. You can give your Heritage Society Membership gift online by clicking here. A 25% discount on historic CDs and DVDs. An attractive certificate suitable for framing. A distinctive 8”x 2” antique bronze plate (with members name in raised lettering) placed on the Heritage Society plaque. A 10% discount on historic CDs and DVDs. A distinctive 3”x 1” brass platelet (with members name engraved on it) placed on the Heritage Society plaque. The IPHC Heritage Society offers In Memoria inscriptions for a deceased individual or married couple. You may memorialize family, friends and leaders who have greatly influenced your life with a onetime donation of $250. The honoree’s name will be engraved on a special section of the Heritage Society plaque. What a wonderful way to honor those pioneers who played a great role in the heritage we are preserving. Expenses for basic staffing at the IPHC Archives & Research Center are a part of the RDC commitment. However, many costs that relate to document restoration, equipment needs and maintenance (microfiche, microfilm, camera, computer hardware and software, etc. ), development of film, library shelving and archival storage containers make the burden more than RDC resources can support. Therefore, we call on those who understand the importance of preserving our heritage and keeping open the doors of a viable research center for Pentecostal Holiness members, friends, and interested scholars, to step forward. Become an IPHC Heritage Partner with a membership and show your support. Membership fees are tax deductible.